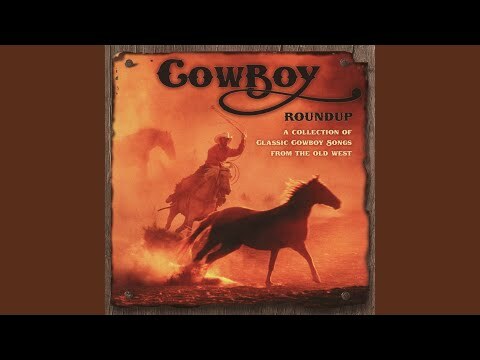 We began our cross country junket in Kansas, and as we trek across the prairie, we soon encounter cowboys for this is their terrain, filled with long dusty days and cool starlit nights. 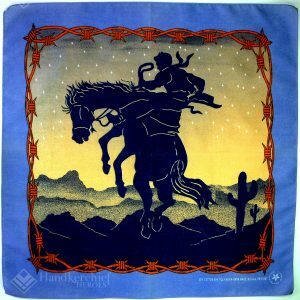 (If you’re ever in Oklahoma City, be sure to visit the National Cowboy & Western Heritage Museum which contains inspiring and memorable western art. It houses some extraordinary paintings you could view for hours.) 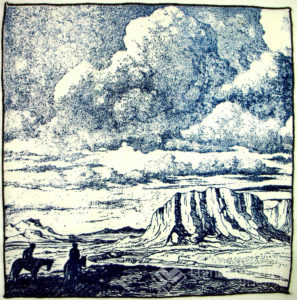 The Oklahoma Territory was originally home to tribal nations of the Southern Plains. 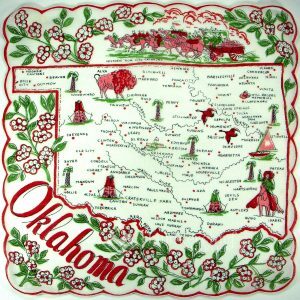 Oklahoma is the joining of two Choctaw works “okla” and “homma” meaning “red people” or American Indian. In 1830 Congress set aside Indian Territory as part of a forcible relocation of the nations from their homelands via the Trail of Tears, a shameful chapter in U.S. history. 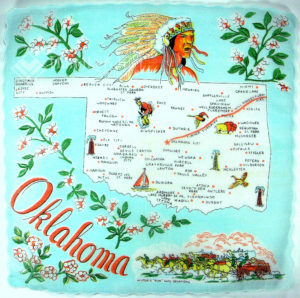 Note many of the cities in Oklahoma take their names from Native American tribes – Cherokee, Pawnee, Atoka (a Choctaw chief), Cheyenne, Chickasaw, Muskogee (Creek), Seminole, Shawnee, and more. In addition to being displaced, after the Civil War, many relocated tribes again lost portions of their new homes in Indian Territory due to renegotiated treaties. The new lands were considered Unassigned Lands and pioneers eager to establish a homestead claimed the territories in great Land Runs. 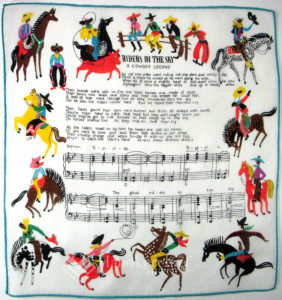 Note the Run is depicted at the bottom of the hankie above and the top of the hankie below. The Land Run races of 1889 commenced at the firing of a pistol, but some enterprising renegades “jumped the gun” arriving “sooner” than the rest to claim their territory. Today, a “Sooner” denotes one who is resolute, audacious and fearless. 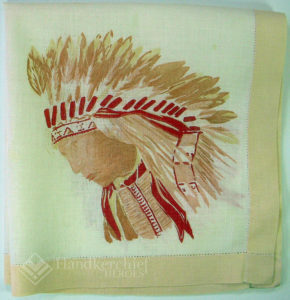 I love the soft chamois shades in this Indian Chief handkerchief. The ghostlike visage devoid of fine detail allow him to stand for every man. contradiction and misunderstanding. But it is worth the effort at comprehension. It is, after all, at the center of our national identity. 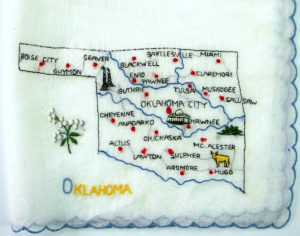 This hand embroidered souvenir hankie features the ever famous oil wells, along with the state flower – mistletoe! The official wildflower is the Indian Blanket. 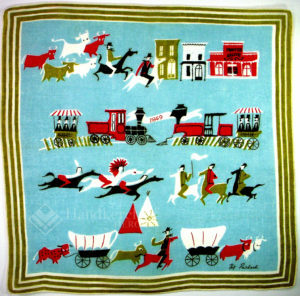 It’s all here in a single image – the cowboy driving his cattle through the center of town, the advancing of the railroad, the wagon trains of the pioneers, and the Indians battling soldiers who want to drive them from their land. 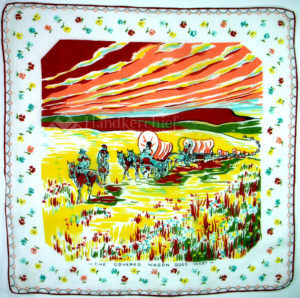 From the calico print border to a sky aflame at sunset, this caravan of covered wagons depicts the vastness of the landscape. A homesteader in the lower left corner waves hello to a passing stagecoach, the only sign of outside civilization she may encounter for weeks or months. 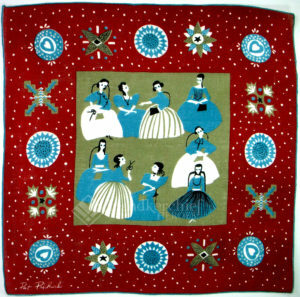 Ladies gather for the popular and paramount quilting bee – a source of camaraderie, creativity,and connection. 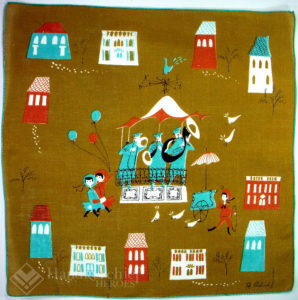 These were circles of cheer and comfort where skills were perfected, recipes traded, and solace shared. The first image feels very east coast with elaborate quilt squares of wreaths, vines and American eagles. Ladies’ attire includes bonnets, cameo necklaces and plenty of petticoats, while well behaved children in pantaloons and high button shoes wait politely to be acknowledged. 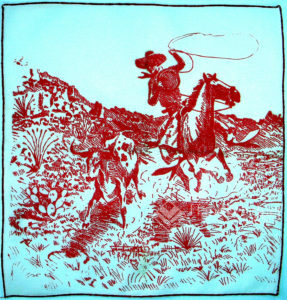 Below, the image is decidedly western. 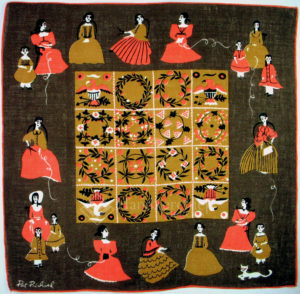 Women who live miles apart draw close for whatever time they have together, and the calico border is adorned with images that echo Indian jewelry – Zuni petit point sunbursts and Navajo sand cast silver crosses. 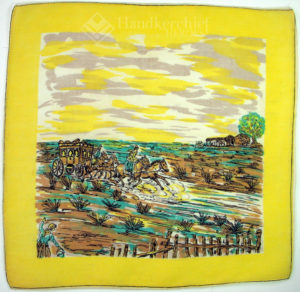 Love both hankies! is not just a way of passing time. It is the way the wisdom gets passed along. Where will these ladies display their needlework? At the County Fair of course (note the quilts displayed in the southeast corner) along with homemade preserves, cakes and pies. Meanwhile, those who raise livestock hope to bring home a blue ribbon or two. What a terrific compilation. 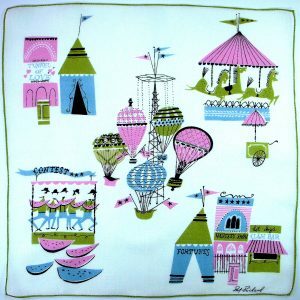 Its companion piece features a first class fair with all the fixins’, including hot air balloon rides, fortune telling, and a carousel. The heart of a town was often its park, where folks would gather near the bandstand for lectures, concerts, or simply to meet up with friends. 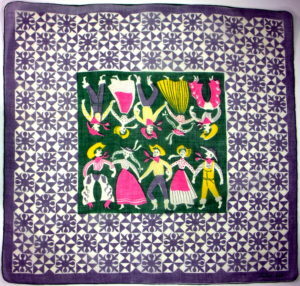 Farmers dance with the rancher’s gals. 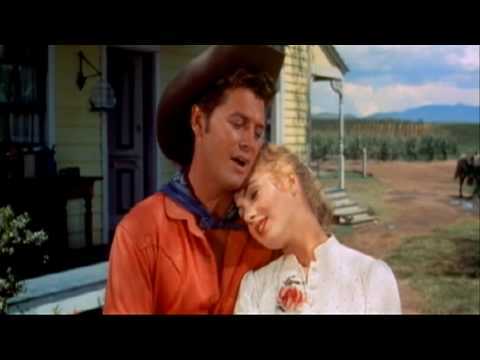 The 1943 score for Oklahoma with music and lyrics by Richard Rodgers and Oscar Hammerstein II includes such masterful gems as “People Will Say We’re in Love”, “Oh What a Beautiful Morning” and of course “Oklahoma” which truly captures the spirit of the plains. It’s impossible to choose a favorite, so here’s a link to the playlist. 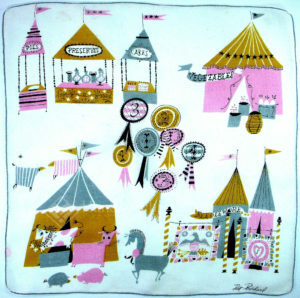 For your viewing pleasure, here’s a You Tube video that combines handkerchiefs from both the County Fair and the Circus, two occasions that would bring people out for an afternoon of fun and entertainment. After 146 years, Ringling Brothers and Barnum and Bailey Circus packed up the big tent forever on May 21, 2017, so that experience is lost forever. In the last century, when a young man craved adventure, he would often go west, as seen in this blog, or perhaps run away to join the circus, so we’ve decided to combine aspects of “the adventuresome spirt” here. They are showcased against a background of Scott Joplin ragtime piano. View our circus blog HERE.